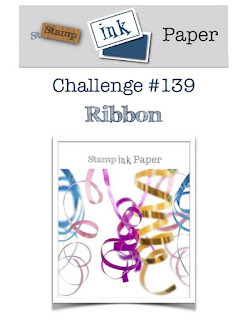 Welcome to our challenge for this week at Stamp Ink Paper which is a product based Ribbon challenge. I needed a couple of quite masculine cards so I've pulled out my Soft Sayings Card kit to see what I could find and created these cards, stepped up a little from the basis of what is provided in the kit. I added some Tranquil Tide cardstock for the base and added my own twist - Lemon Lime Twist ribbon, lol. Everything else including the embellishments and washi tape is actually provided in the kit. Even some envelopes for the cards, so these were super quick to make. Here's a closer look at the one of the cards. I love how the finish card turned out and I feel like Tranquil Tide makes a great masculine colour. I've used that ink for the Greeting as well. Thanks very much for joining us this week at Stamp Ink Paper and don't forget, just by playing along you could be our next guest designer. We look forward to seeing your creations. 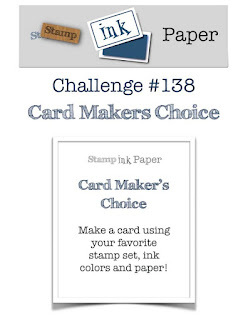 Welcome to this week's challenge at Stamp Ink Paper. I'm so happy that this week is our Cardmaker's Choice challenge so that I can share with you the Birthday card I made for my daughter who turned 17 on Sunday. She is a makeup loving girl with an addiction for Eyeshadow Palettes so that was my inspiration for creating her birthday card this year. Here it is, and she loved it. So did her sister who I showed a preview to and she said it was the coolest card I've ever made. How's that for a compliment from another Makeup loving girl. It made my day. I've chosen to do the Diagonal line "Sequins, Flowers, Embossing". What will you choose. I've used a combination of Sweet Soiree dsp, Cake Soiree bundle and Petal Pair textured embossing folder for my card. The cardstock is Berry Burst and Whisper White. Here's a closer look at the tag I created for the greeting and the sequins. I would like to take this opportunity to remind you that you can become a Guest Designer for Stamp Ink Paper just by playing along with our challenges. 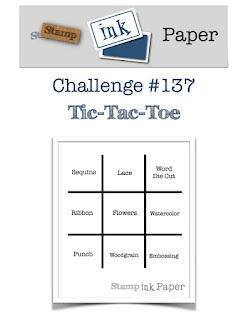 Thanks so much for joining us this week at Stamp Ink Paper for our Tic Tac Toe challenge. 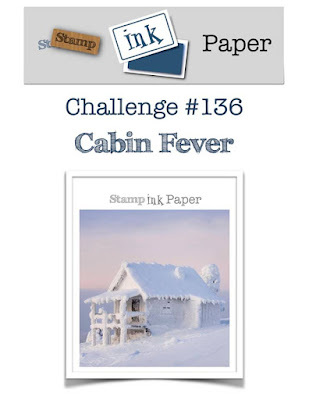 Welcome to our themed challenge this week at Stamp Ink Paper. Here's my card using Seasonal Layer framelits. I wanted to make something the exact opposite of Winter. While we don't have snow where I live in Australia and its Summer here, I can certainly sympathise with my Northern Hemisphere friends. The cardstock I've used is Crumb Cake, Basic Black, Sweet Sugarplum, Bermuda Bay and paper from the Serene Scenery stack. Here's a closer look. I tore the bottom of the Beach paper and did a little sponging of the edge to make it look a little more like the sand on the beach at the water's edge. We also have some exciting news to share this week. Sarah Fleming is our Guest designer this month and you too can become a Guest Designer for the Stamp Ink Paper team just by playing along with our challenges. Thanks so much for joining us this week at Stamp Ink Paper and have a great day.